Uncommon early European map of Beijing or Peking China. Plans of the Old & New City of Peking Metropolis of China. 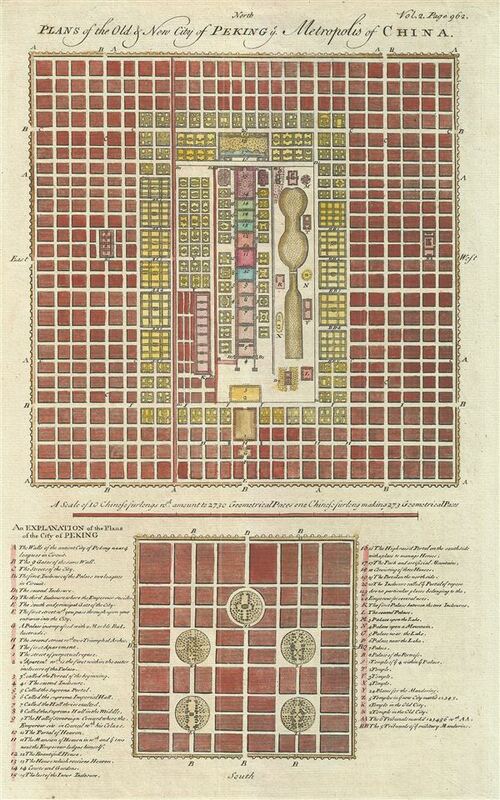 An uncommon and appealing 1744 map of Beijing or Peking, China. The map features two maps of Beijing both drawn to scale. The larger upper map illustrates 'New Peking' c. 1700 while the smaller map shows ancient Beijing. Both maps feature numerous numbered and/or lettered sites corresponding to a key in the lower quadrants. The key identifies such sites as the 'Portal of Heaven,' the 'Hall Thrice Exalted,' the 'House which received Heaven,' and many others. The map was mostly likely engraved by Bowen to illustrate John Campbell's 1744 posthumous publication of John Harris' collection of Collection of Voyages and Travels. The engraved map offered here is most likely the work of Emmanuel Bowen, who produced most of the maps of Harris' work. John Harris (c. 1666 – 7 September 1719) was an English writer, scientist, and Anglican priest. He is best known as the editor of the Lexicon Technicum: Or, A Universal English Dictionary of Arts and Sciences (1704), the earliest of English encyclopedias; as the compiler of the Collection of Voyages and Travels, published posthumously under his name by John Campbell; and as the author of an unfinished county history of Kent. Harris was born in Shropshire England and studied at Trinity College, Oxford. In 1696 he was elected a Fellow of the Royal Society, of which he briefly served as vice-president. He unfortunately died in poverty due to fiscal mismanagement. Harris, J., Navigantium atque Itinerantium Bibliotheca, or Complete Collection of Voyages and Travels (London) 1744. Very good. Blank on verso. Platemark.